I am looking for antisemitic caricatures in France between the two World Wars. I can find examples both from before and after, e.g. ones related to the Dreyfus case, but none during this period. Are there no known example of historically significant antisemitic caricatures in France during this period? There are many examples of antisemitic caricatures in the far-right French press between the two world wars, especially in the thirties. It is not so easy to find them on the net (I don't know where to look), but a good library with a collection of the journal "Je suis partout", one of the most famous of those journals, should give you plenty of examples. 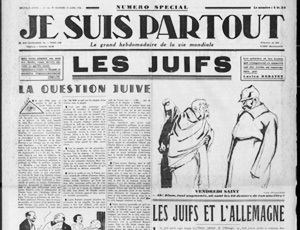 Since there is no reason for AntiSemitism in France to have died out because of the treaty of Versailles only to spring right back at the outbreak of WWII, the reasonable conclusion is that there were AntiSemitic cartoons as usual during the period, to reflect the known levels of AntiSemitism in France at the time. Not to single out France, as there was an amount of this feeling in all countries in this period. Not the answer you're looking for? Browse other questions tagged france art antisemitism interwar or ask your own question. Where Can I Find Historical Candidate Photos of U.S. Elections (both winners and losers)? Why does the rooster symbolise France? Why was an independant Saarland country created twice after each world war?